This article will show you how to install and get started quickly using WebMatrix 2. WebMatrix is a lightweight, easy-to-use tool for creating web applications. In this article, we'll look at where to find the latest version and how to get started with using the tool. 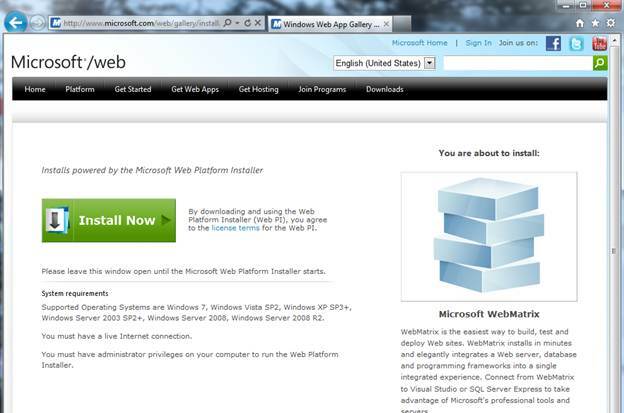 To get started, you just need to go to http://www.microsoft.com/web/webmatrix/next/ to download the latest version. By default, WebMatrix installs using the Web Platform Installer, which is a handy tool for getting all fo the things you need to quickly get started building web sites and apps with Microsoft's stack of technologies and tools. Click Install, and it will determine whatever prerequisites it needs and proceed with the installation.